Who can resist delicious crispy homemade vegetable tempura? When making tempura at home, the goal is a crispy yet airy coating that doesn’t absorb oil when deep fried. I’ll teach you how to achieve excellent results in this recipe. Alongside sushi and ramen, tempura is another mandatory menu item for Japanese restaurants. Encased in a crunchy, crispy yet light batter, these perfectly deep fried seafood and vegetable are seriously addicting. After sharing my Shrimp Tempura recipe, I am excited to share today’s recipe on Vegetable Tempura since many of you have requested for it. Dipped in batter and deep fried, each vegetable gets cooked perfectly on the inside, while the natural sweetness and flavor is enhanced. 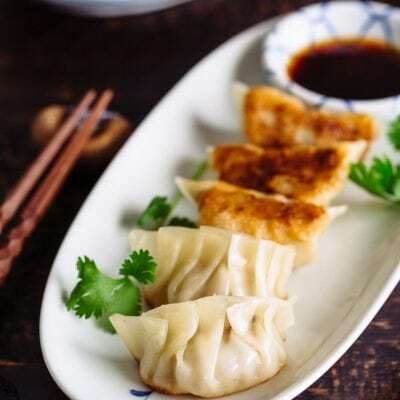 You would enjoy them piping hot with a delicate dipping sauce with grated daikon. 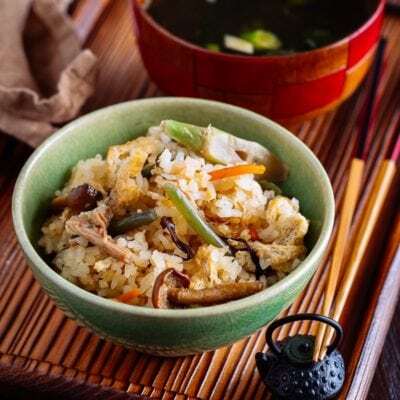 Some of the common vegetables used for Tempura include Japanese sweet potatoes, mushrooms (shiitake or king oyster are delicious), Kabocha squash, bell peppers, lotus roots and eggplant. When I make vegetable tempura at home, I also like to include shiso leaves as well. Before I start talking abut how to make Tempura, please understand that even for the Japanese, making perfect Tempura is not easy. It requires a lot of skills and practice so don’t be discouraged if your first tempura does not look like ones from restaurants. But how do you get that crispy texture without the food being too oily? The key for perfect tempura is batter and the temperature of oil. I created a few steps below to go over the tips for making tempura. Most of Tempura chefs recommend that flour to water ratio should be 1:1. Some recipe requires an egg (or two depending on the amount of flour and water), and some don’t. It’s up to you. When the batter is too thin, the ingredients won’t have much of batter around it and there is no fluffy and crisp texture to it. When the batter is too thick, you feel like you are eating the chewy exterior. Please remember few tips about batter. Always mix the batter using chopsticks for only a few seconds to at most 1 minute, leaving lumps in the mixture on purpose. Overmixing the batter will result in activation of wheat gluten, which causes the flour mixture to become chewy and dough-like when fried. Cold batter is absolutely necessary for the unique fluffy and crisp tempura. All the ingredients (water, egg, and flour) must be cold prior to making batter, and batter has to be made RIGHT BEFORE you deep fry and has to be kept cold at all times to avoid activation of wheat gluten. The Tempura specialty restaurant uses a special blend of oil that is a combination of many kinds of oil. Each restaurant has their own secret recipe and blend that they perfected over years. At home, you can simply enhance the flavor by adding sesame oil into the vegetable oil. The temperature has to be between 320-356°F (160°C – 180°C) depending on how long it takes to cook through the ingredients. If it takes a long time to cook, then deep fry at lower temperature because high temperature will cook the batter too fast and inside won’t be cooked thoroughly. And remember, cold battered ingredients will lower the oil temperature quickly; therefore, if you need to deep fry vegetables at 338°F (170°C), you need to bring the oil to 356-365°F (180-185°C) first. If you ask me what’s the most difficult part of making Tempura, I’d say it’s to keep the right temperature at all times while deep frying. It cannot be too high or too low. Most of the time I do not require thermometer, but if you are not used to deep frying, I highly recommend you to get a thermometer to precisely know at what temperature you are deep frying. The right sound of tempura being deep fried is like a light sound. Like cider just being opened. That kind of light bubbly sound. In order to maintain the correct temperature, do not over crowd with ingredients when deep frying. 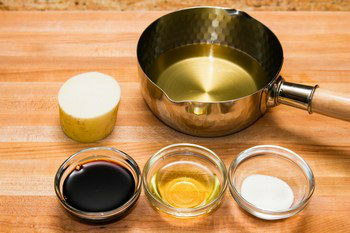 As a guidance remember just half of oil surface should be covered with ingredients. When you put too many ingredients in at once, the oil temperature will drop too quickly. What if the oil gets too hot? The quick solution to this is to add a bit of extra oil or add more cold battered ingredients. Like I said, it is all about temperature control when deep frying. Lastly, please pick up crumbs in the oil between batches. The burnt crumb will attach to your new tempura if you don’t pick them up, and oil will get darker once the crumbs become burnt and it leave a bad flavor in the oil. Who can resist delicious crispy homemade vegetable tempura? When making tempura at home, the goal is a crispy yet airy coating that doesn't absorb oil when deep fried. I’ll teach you how to achieve excellent results in this recipe. Combine dashi stock, mirin, sugar, and soy sauce in a small saucepan and bring it to a boil. Then lower the heat and let it simmer until sugar is completely dissolved. Remove from heat and set aside. 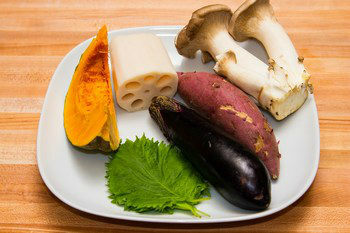 Slice Japanese sweet potato into thin pieces and soak in water for 15-30 minutes to remove excess starch. Then dry them using paper towels. 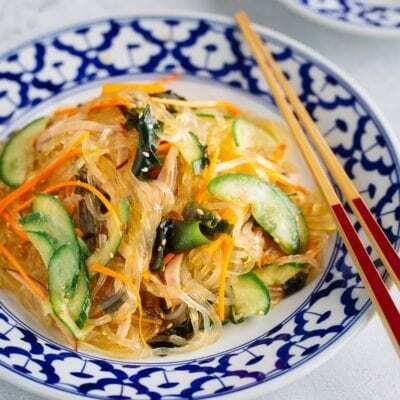 Cut kabocha squash and lotus root into thin slices. Soak lotus root in vinegar water (2 cups water + 1 tsp. vinegar). 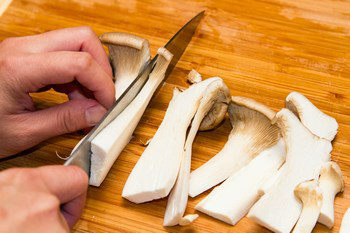 Cut King oyster mushroom into thin slices. Discard the head of eggplant first, then cut it in half lengthwise. 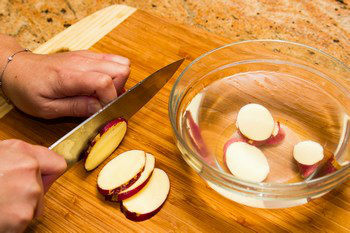 Then cut the eggplant lengthwise into very thin (about 1/8 inch) slices leaving the top 1-inch part intact. Gently press down on the eggplants to fan the slices out. Once the ingredients are ready, heat 1 1/2" (3 cm) of the oil to 356F (180C) in a deep fryer or pot. 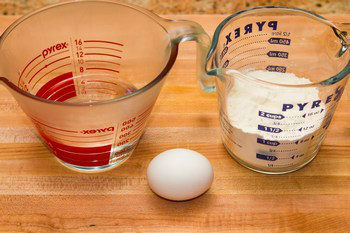 To make batter, sift the flour into a large bowl. Whisk vigorously and discard the form on the surface. 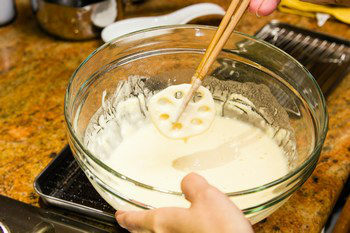 As you slowly pour the egg mixture into the flour, mix the batter for about 1 minute with chopsticks in a figure 8 motion. Do not over mix and please leave some lumps in batter (See Notes 1). Keep the batter cold all the time (See Notes 2). 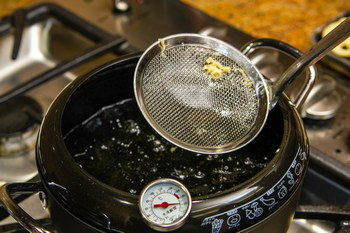 Start deep frying from the root vegetables as oil temperature needs to be a bit lower than non-root vegetables. If the ingredient is wet, dry them with paper towel before dredging in the batter (See Notes 3). For root vegetables, deep fry at 320°F (160°C) for 3-4 minutes. For vegetables and mushrooms, at 338-356°F (170-180°C) for 1-2 minutes. Do not over crowd with ingredients. Remember you only put ingredients taking up about 1/2 of oil surface area (See Notes 4). For shiso leaves, sprinkle a bit of sifted flour on the back of leaves and dip only the back of leaf into the batter and deep fry for 15 seconds (See Notes 5). 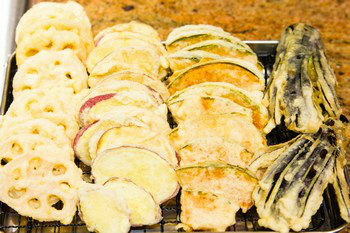 Transfer tempura to a wired rack or paper towel to remove excess oil. 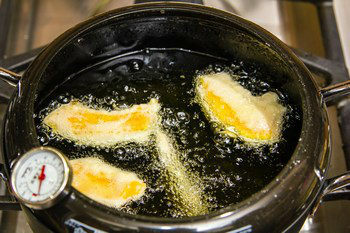 Between batches, Between batches, remove the crumbs which will burn and turn the oil darker if left in fryer. Grate daikon and squeeze water out. 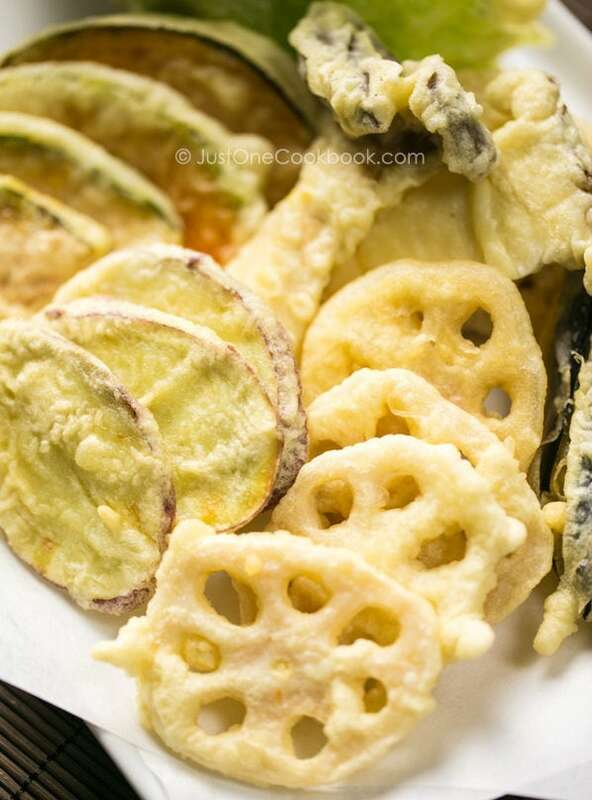 Serve tempura immediately with grated daikon. 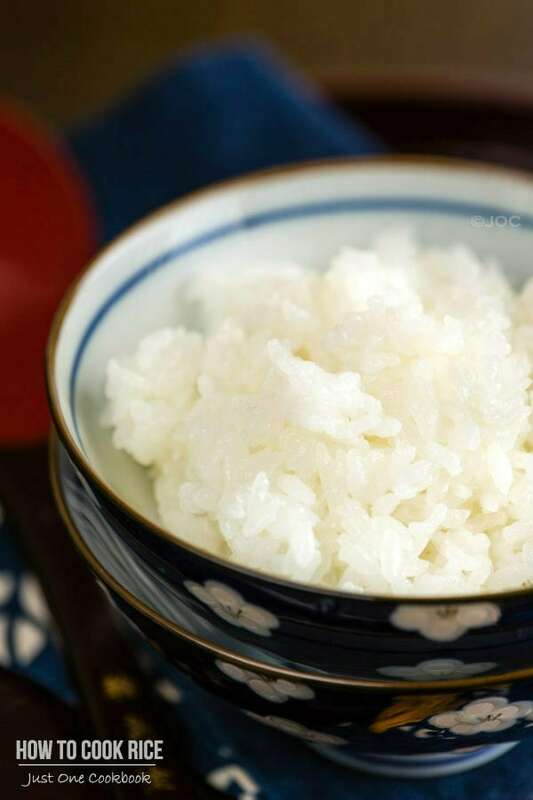 To enjoy, add grated daikon in tempura dipping sauce for refreshing taste. 1: Make batter right before deep frying to avoid activation of wheat gluten. 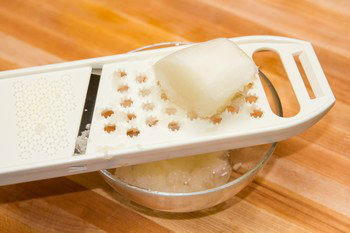 2: Add 1-2 ice cubes in the batter or put the batter bowl in a larger bowl containing ice water. Make sure to keep the batter cold all the time. 3: While tempura is being fried, moisture from the ingredients will be evaporated and tempura will become crispy. However, if the ingredients have extra moisture, the tempura will become soggy after being deep fried. 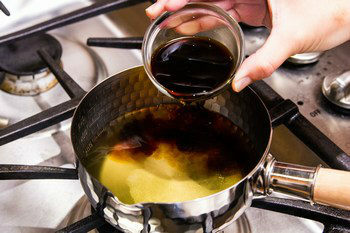 4: When you put too many ingredients, the oil temperature will drop quickly. Make sure to keep the right temperature all the time. 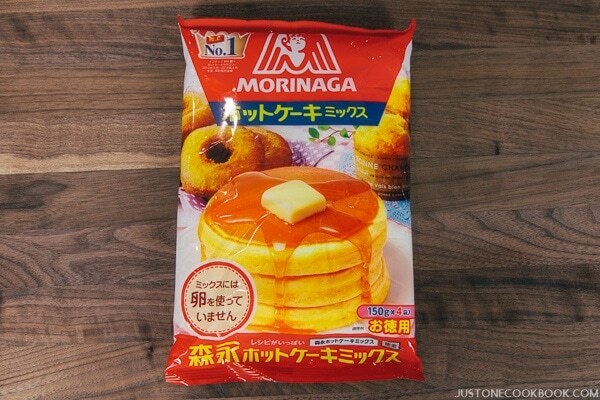 5: For ingredients that are hard to keep the batter on, such as Shrimp Tempura, Kakiage, or shiso, we dust extra flour before dredging the ingredient in the batter. 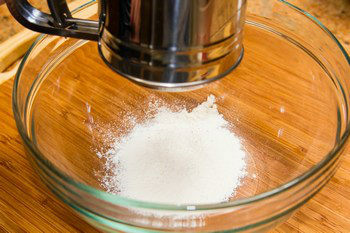 Flour works as a glue and batter tends to stay on the ingredients. Editor’s Note: The post was originally published on Jan 20, 2013. Great tutorial with all the steps and supporting images, Nami! Now, I am craving tempura for dinner (instead of the fish tacos we’re making!). Love this! I love vegetable tempura! Yum! Great, instructive post. I haven’t made tempura, but I love it (who can resist fried things? ), so I really should. 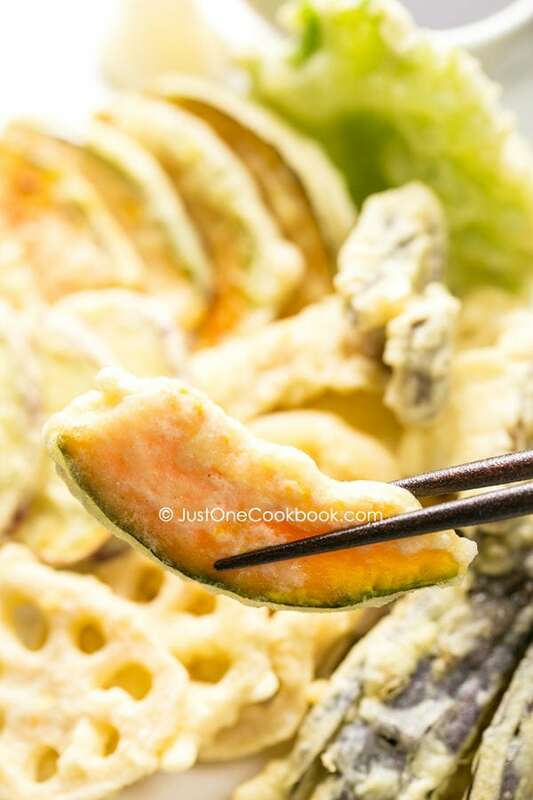 I tend to prefer vegetable tempura, so this recipe is right up my alley. Great tips on controlling the temperature of the oil. Good stuff – thanks. Thank you for sharing this great tutorial. I love tempura, and sweet potatoes are my favorite way. I think I can do this, myself! Hi Nami! Thanks for sharing the tips on the batter and the oil temperature. Agree that these 2 are the keys to good tempura. Mmmm… Looks so delicious! I must say, I made your eggplant parmigiana recipe and your deep fry instructions were spot on. I think I have deep fried less than 5 times in my life before your instructions, and it turned out!!! Anyways, just want to reiterate that you give really awesome and easy to follow deep fry instructions that works! Hi Vivi! I’m happy to hear my instructions were helpful. I sometimes worry if my explanations are clear enough. Thank you for your feedback! Glad to hear you felt comfortable deep frying. I have mentaiko in my freezer. I should totally make that soon. 🙂 Thank you Vivi! Thank you for this post….as I loves anything tempura. Your tutorial pic has always been very helpful for us to achieve the best result. YUMMMMM! And that lotus root is just too pretty! 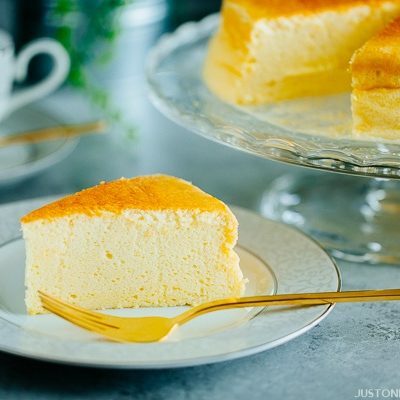 One of my very faves is your Japanese Cheesecake… It is on my to do list. I love vegetable tempura! This looks so good, Nami – I’ll trade you a platter for the dessert of your choice :). I love tempura vegetables but I’ve only ever had fantastic ones in Japan. I love Tempura & I’ve always thought that Tempura is a cheap thing. I realized I was so wrong when my Japanese friend brought me to a Tempura restaurant at Ropongi Hills. Their price? $200++ per person!! Nami, your home is one I could happily eat in every single day. Delicious! Looks fantastic. Just one more question: how do you keep the fried tempura hot? The few times I tried to make it, we just ate every fried batch and went back to the kitchen. Not ho good, if you want to make it for guests. Any suggestions? Thanks!! Hi Lara! Ideally, Tempura should be eaten right after deep fried. I’d deep fry the amount you serve first, then do a second batch (for second round) if it’s for guests. Otherwise you just have to drain excess oil from the tempura after fried. Placing tempura vertically helps to drain excess oil. Use wire rack rather than paper towel, so bottom is not going to be soggy. When you serve, re-heat using a toaster oven and that helps in terms of crispiness. Hope this helps! Well, this recipe came just at the right time:) Last week we’ve been to a local Japanese Restaurant with some friends, and among others we served Vegetable Tempura which I loved a lot. I was about to search for a recipe when I saw your post about this:). Maybe I will have the courage to try it. Nami, if you really would like to know which one is my favorite posts on your blog,I have a new favorite, it must be today´s Tempura – you have given such very valuable tips and techniques on making perfect Tempura, I am amazed at your skills! 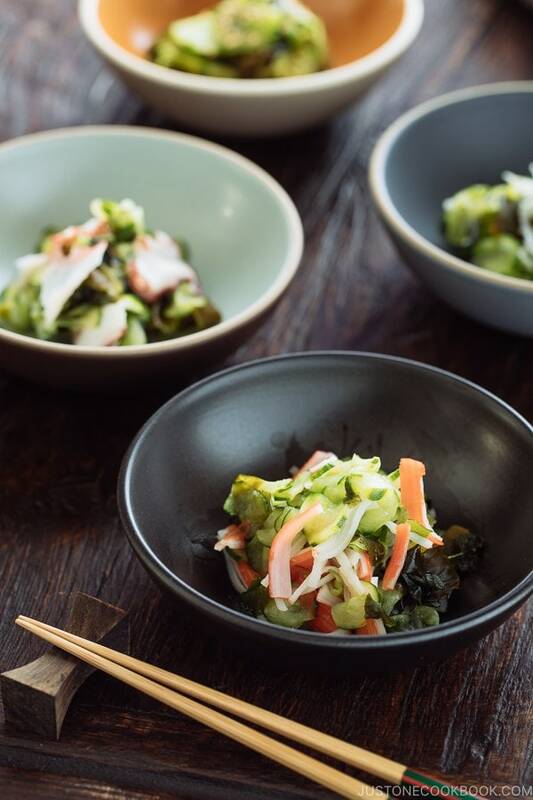 My favorite is the shiso leaf, it looks just so pretty – anyone being served your platter with the perfectly prepared Tempura should just be totally impressed – I am by just looking at it! Hope all is well with your and your family! Greetings from the very snowy and cold Bonn! Great tips, Nami-san! Thank you. Oh I never thought of using chopsticks to coat the veggies. The prepacked flour always indicated to add 1:1 ratio of water and flour, but I think less water is always required. Otherwise the batter is to liquid. 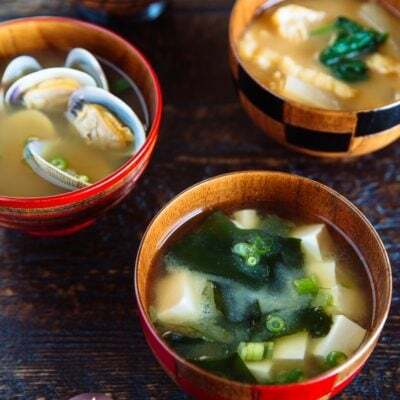 I loved your tips Nami and I am looking forwards to try them out soon. These tempura vegetables are beautiful! I love the lotus root! I love the interesting vegetables you chose. the veg tempura looks perfect. perfectly fried with no traces of oil. Nami, I’m grateful for your tempura tutorials (this one and the one for shrimp — the video “how-to” for the shrimp was incredible — thanks for the links.) Can’t wait to try it! I like your batter Nami, I don’t think it absorbs oil, and looks crunchy! Wow..such useful tips, Nami.. avoiding over mixing and adding cold water will help me go a long way to make a perfect Tempura the next time..thanks! OMG I;m just dying for vegetable tempura I can eat a whole basket by my self! I just looove your pictures! I love every single recipe on your blog Nami. I LOOOOVE tempura! 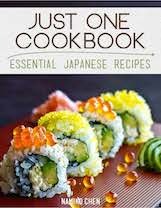 Nami, my brother would totally love this if I could make it for him! haha.. Thanks for the delicious and easy recipe plus the valuable tips on how to make tempura correctly, Nami! Thanks for the great tips, Nami! 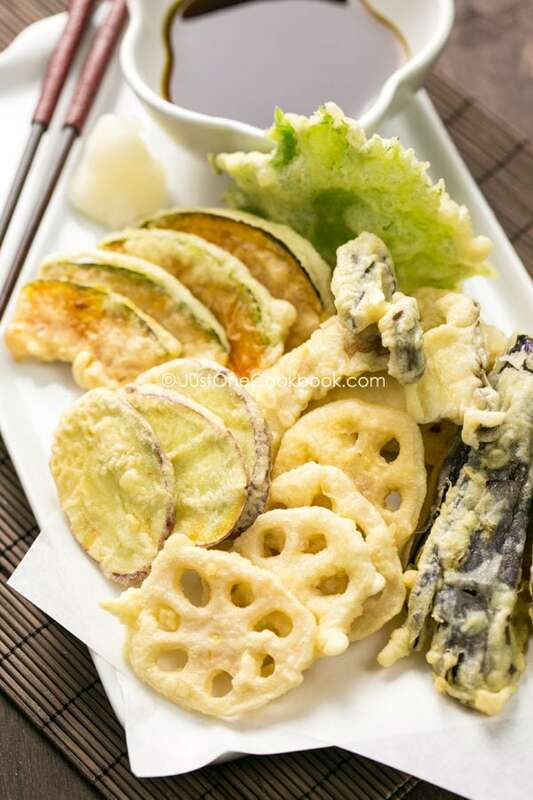 Those lotus root and sweet potatoes slices look really delicious. I tried making it before, but I just can’t come close the real thing in Japan. When the Japan Fly Fishers group had a small event at a member’s farm in the mountains outside of Tokyo, the owner took me around the farm to pick up these wild greens (I can’t remember the name), and then mushrooms he was growing on the back of logs. Then we took them back to the house and fried them up in tempura batter. I was forever hooked on tempura after that. Thanks for bringing back those memories! Beautiful and very tempting! I love the fact that you’ve also used kabocha squash to make them. I love this lesson on tempura Nami! Those tips are going to come in very, very useful. I had no idea about not activating the wheat gluten. I’m looking forward to trying my hand at this! I hope your week is going well. Have a wonderful day! Hi Nami! I just love tempura, and the vegetables are my fave on the platter when we eat out. But when I cook it at home, I know what you mean about the batter and temperature of the oil. I love how your vegetables look in the photos, so crisp and crunchy. I’m going to make some soon. Thanks for the recipe. Happy Monday! 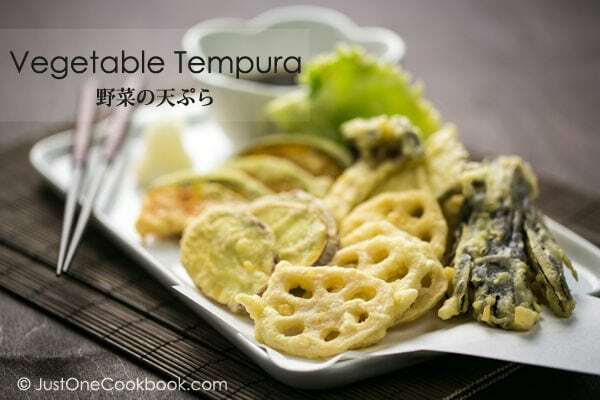 Your vegetable tempura looks delicious! I usually julienne some carrots, gobo, and string beans but leaving them sliced looks so professional! Thank you for your tips on the batter and oil temperature, too! When I have some leftover root vegetables, I usually cut them into julienne strips and make Kaikiage Don. 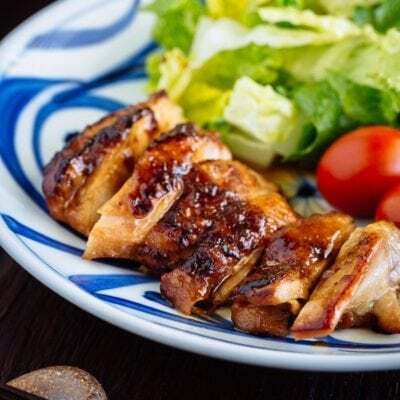 It’s a really quick meal that everyone loves… and I usually put a lot of satsumaimo just for myself and my son. 🙂 So good! Nami – You are seriously making me drool! I want some now. Nami, it looks divine and you made it look so simple! I have your Japanese Cheesecake in my to do list, I found your recipe delicious. I saw in a food program that the chef made the batter for tempura inside a bowl with cold water, and he always remind it has to be cold and fresh. I love tempura…especially the kabocha…yours look so good, really professionally done Nami. I feel soooo much better after reading you saying making tempura isn’t as easy as people think. Phew… yours look so lovely and very light. Growing up, I’ve always loved tempura. Who doesn’t? They’re crispy, crunchy, and tasty. Hooray! Tempura batter! I needed a good one to use, and you’ve met my wishes! Thanks Nami! I will make some with gluten free flour. Soo perfect! Normally i don’t like tempura but seeing yours making me change my mind. Even if tempura is deep fried, they always feel so light. I can’t wait to try your recipe. 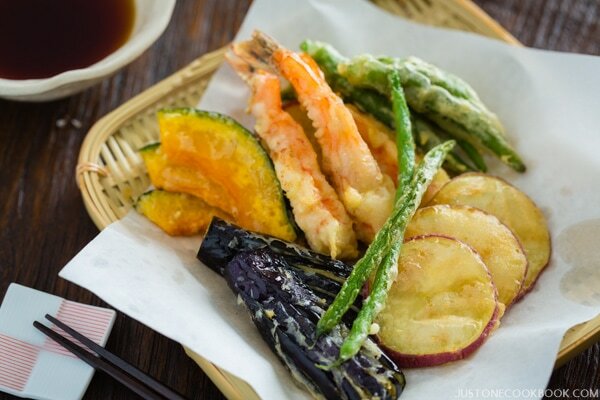 Ebi tempura and vegetables are some of my favorite Japanese food. Thanks for showing the procedure Nami! Your vegetable tempura looks absolutely stunning. I’ve had veg tempura on a couple of occasions and this one surely makes me drool. Love your step by steps. Sure to give this a try sometime soon! Nami, I’m impressed by your tempura. I do prepare tempura from time to time (I don’t know why, but I long for it rather when it’s warm outside…) so I know how difficult it is. Some products are easier, some more difficult and as you say it takes practice to obtain satisfactory results. I still have to work hard to obtain such perfect tempura as you! I love eringi, I have it quite often grilled, but I would have never thought of “tempuring” it! Excellent idea. It’s interesting to see your most popular recipes… It’s impossible to say which of your recipes is my favourite. I make so many of them! The one I prepare most often is korokke though… (The one with meat, mushrooms and carrots). A real comfort food for us. Thank you! Oh… Nami… I love tempura! Thanks for this beuatiful article, I have saved it and soon I will test your recipe and procedure. This looks so perfectly done! I was looking for king prawns at the Asian market to make shrimp tempura but they were out of it. I will try it with these veggies first. 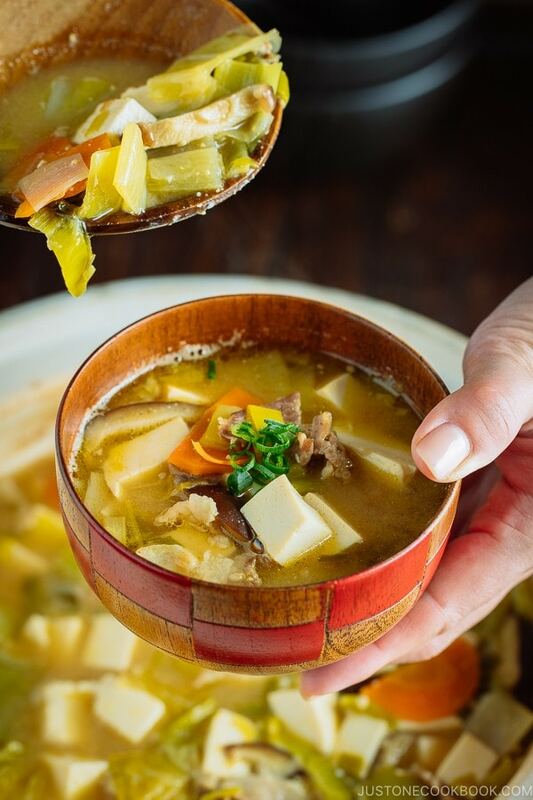 I have most of the ingredients except for the dashi stock. Veggie tempura is my favorite thing ever! My fiance and I rate various restaurants on the quality of their tempura. Thank you for this tutorial, I have no clue how to make myself. I am saving this. I do a lot of deep fries, and though I am mostly guided by instincts, your explanation makes so much sense to what I have experienced when frying anything. Like too much mixing making the exterior chewy…..lovely!!! Those tempuras look mouthwatering. i just know that perilla/sisho is edible in tempura, i just curious about the taste…. Great tips on making a perfect tempura, and beautiful photos! I have always wanted to make tempora but I don’t have a fryer! Either way, Love this! so perfectly fried! Such a lovely tempura, Nami! It looks absolutely scrumptious and perfectly golden brown. Thank you for sharing one of my favorite dishes! I haven’t had tempura in years but always loved it when I did. You share so many great tips to insure perfection. Now I’d like to try and make some of my own. Thanks for sharing. Sorry I haven’t been by lately! WOW! Who knew so much went into tempura? I sure didn’t. No wonder it’s so light and airy and addictingly good. Good thing I can’t reach in and grab this because I’d eat the whole plate! I owe you a big email, Nami. Miss ya! oh how perfectly crispy and yet moist! I would love to eat at your restaurant- you really should open one up! You have the most amazing food that pulls people from all backgrounds to drool over your food! I love tempura!! Who doesn’t, right? Everything looks so good. I love tempura and am so happy to see a veggie one here! It looks perfect! Every dishes in your blog i also love it!! hehehe..Thanks for sharing the tips on how to get nice Tempura..
Wow your tempura is so perfect! The recipe I used last time didn’t have egg in it. Looks like I gotta try yours! This looks divine Nami. I love tempura and thanks for the step by step. I’ve definitely had some times where my tempura batter turned out too thick/thin so I’ll be referring to this post often! Great to have your secrets! Now I can make my own batter! A very informative post Nami! Will refer back to this one for sure. I am salivating for your perfect tempura. I still want the cheesecake, lol. But I’d have to say this is one of my favorites also. My oldest daughter ordered this all the time. I’ve never tried it at home, it’s doesn’t look that hard though. I might have to try this before the cheesecake, my pants will thanks me. Hope you are having a great week. Thanks so much for the tips, Nami. This is such an art, but I really would love to practise this at home. You never cease to inspire me with your Japanese dishes, Nami. Last time I made prawn tempura was after our holiday in Thailand 18 months ago so high time I went for it again. LOVE the veggies, especially the pretty lotus. Great tips too. Bravo. Oh, favourite dish on the site? 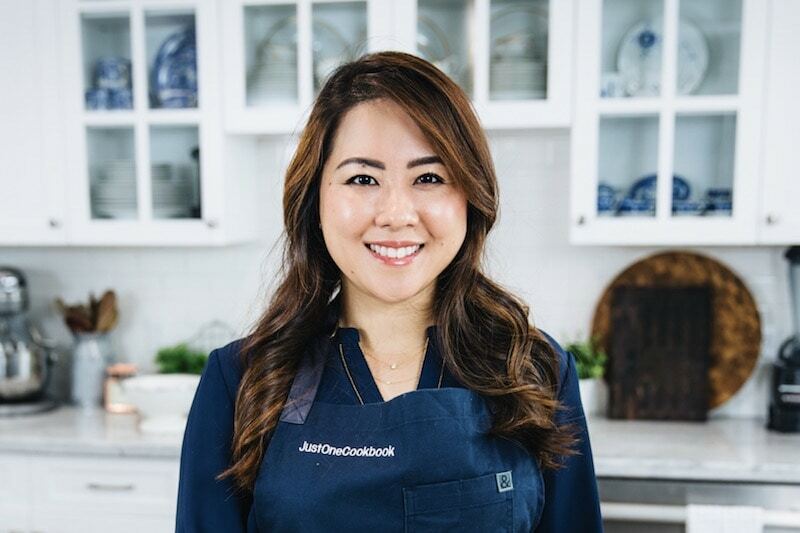 Your quick, easy and tasty Ginger Shogayaki Pork – I’ve got my kids making it now, thanks to you! You didn’t overwhelm me at all, these are great tips. I tried my hand at tempura this summer and it wasn’t nearly like yours but we enjoyed it. I tried to recipes, one with beer and one without. Looking forward to trying your recipe. Thank you for this awesome tempura tutorial! I’m not surprised that the shrimp tempura post is one of your most popular… I think that other than sushi, when many Americans think of Japanese food, the first thing they think of is “tempura!” (even though I didn’t really see or eat tempura very often when I lived in Japan…). Aw! I’m so happy to see your Chicken Teriyaki in your top 5!! Veggie tempera is one of my favorite things to order at a Japanese restaurant. So glad I don’t have to order them any more since I can make them right at home! 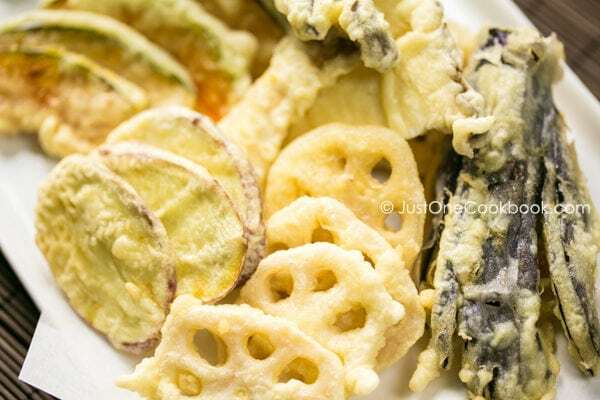 Thank you for sharing all these great tempura making tips! I’m still afraid to try to make some myself though..
My favorite vegetable for tempura is the sweet potato! And then the lotus root. My mother bought me a deep fryer. I’ve only used it a few times. Even with this lovely appliance, it’s hard to get the cooking temperature just right. I’ll have to give it another try with your tips. Maybe I’ll have better success. Hi,nami.I like your recipe so much.and your explanation, is great,I learned many things from you. 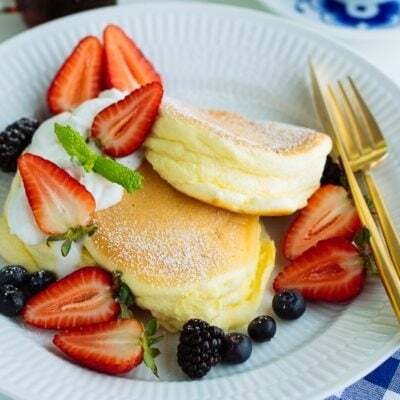 Thanks!But, I’m living in a small town of Spain, can’t found the asia ingredients over here.I had tried CHEESECAKE,DORAYAKI …from here.well,finally was OK,I think so.At least someone said it was good.jeje.And now I have a problem,hope you can help me,please.My son is 2 and half years old.I’m trying to make some food for him evrytime.Like eegs, meatball with the sauce.noodles… But that’s difficult.He didn’t eat well.Just the rice,thin noodles,eggs.He doesn’t like the vegetables,shrimps,some kind of fish.I hope he can like to try everything.I don’t know what can I do for him? So, could you tell me some advice,please. Hi Joanna! I’m really happy to hear you enjoy my blog and thanks for your time to write here. As for your son, it’s hard to advise without knowing more details, but I would suggest to include tiny bit of “challenging” item in his favorite food. Don’t include a lot – start tiny portion, that’s almost not visible…or almost non sense. You can always increase the portion when he’s more “comfortable” with flavor and the look. The point here is to encourage him to eat the one he doesn’t like. He and his tongue will get used to the flavor and texture, and he will also get used to eating things that he doesn’t like. After a while it will be “normal” for him to eat that challenging ingredient. I also recommend to keep rotating his menu. Try not to feed the same food, because one day he’ll say he doesn’t want to eat anything else but the food you are giving to him. It’s better now to show him that we eat different things. Also, prepare some little treat (not like candy). For us, it was a gummy vitamins. We would give them anyway, but we pretended it was a treat saying that they won’t get any if they don’t eat everything. Dolores, egg water is a mixture of egg and water. 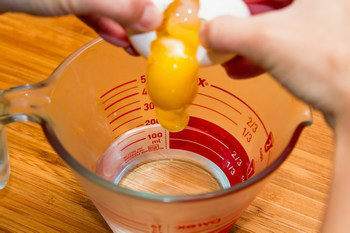 To make 1 cup (240 ml) egg water, you will need to combine 1 cold large egg (40ml) and 200 ml ice water. Lovely , Lovely crispy shrimp and vegetable tempura. Can I use any other leafy green vegetables. Gorgeous. I could eat more than my share of this. Your veggies look so light and they’re begging me to try this at home. Sorry, but has this been translated into English with Google Translate? It’s pretty hard to follow… Love the pictures, and the basic explanation, but certainly not the best tempura recipe I’ve ever read – with some blatant mistakes even. For root vegetables, deep fry at 320°F (160°C) for 3-4 minutes. For vegetables and mushrooms, at 338-356°F (170-180°C) for 1-2 minutes. I tried Tempura Vegetables and Shrimps accoding to your instructions. They were perfect !! yes we all loved it. Wishing you much more popularity. Good evening, thank you, great knowledge that you shared, very much appreciated…..
Nami, How frequently do Japenese cooks use a technique of drizziling the batter (tempura) over the half cooked ebi veggis,and the surface of the oil,then lastly gather-up the finished items with the very course batter drizzilings? Does this techniue have a separate nihon name?Do you think it is worth the extra step to bother with this? Hi Don! Are you talking about home cooks or chefs? Home cooks, it really depends but most probably don’t care too much about how tempura look. 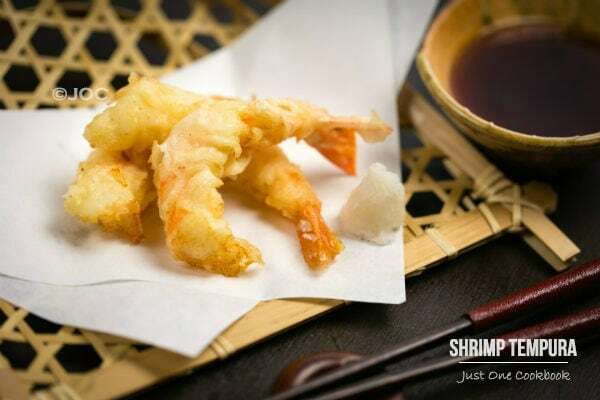 They don’t need to make their tempura look like restaurants’ tempura… plus it’s extra batter = extra calories… it’s all about the look and texture. However, tempura restaurants do that. I’ve seen them pour the batter over the oil/ingredients (and it depends on ingredients). If you ask me, I don’t think extra batter is not necessary but the texture of batter is important even though you don’t have that extra batter around the ingredients. Hi Don! 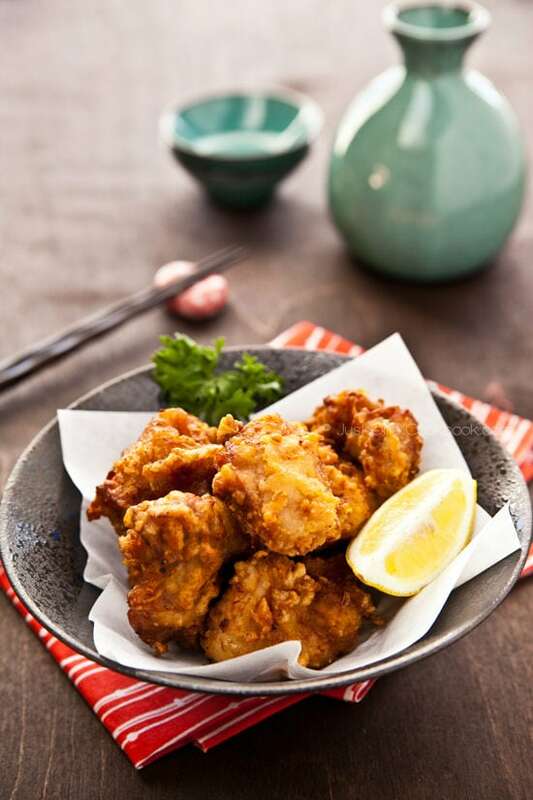 Yeah, it’s common to use beer and carbonated water to make deep frying batter so that the batter stays airy and crisp. I looked into traditional tempura recipes but most chefs at tempura specialized restaurants in Japan don’t use it. 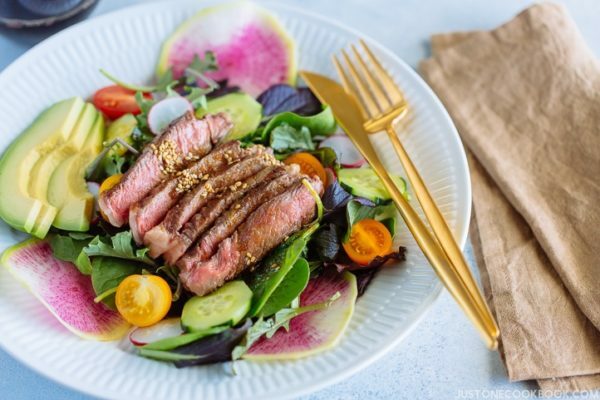 Personally I think it’s a really good trick, but I try to keep my recipes authentic on my blog and try to teach traditional technique… Thank you for sharing your tip with my readers though, I really appreciate it! Looks awesome. You have done a great job. Hi, I recently heard that you can use matcha powder with salt to make tempura sauce with it. I was wondering if you have a recipe for it? 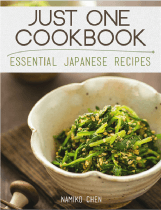 I saw several recipes with just matcha powder and salt, but I didn’t know if they were authentic Japanese recipes or not. Hi Apple Girl! Yes we enjoy it with matcha salt too. 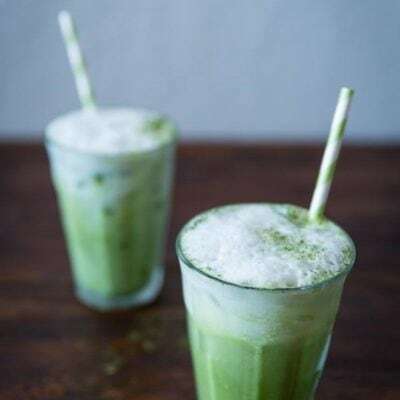 It is (good quality) matcha and salt (kosher or sea salt is great). More matcha than salt, there is no specific recipe for it, but just sprinkle some salt into matcha (not the other way around). Hope you enjoy! Looks so delicious. I think I need to get ambitious and try this. Thank you for linking to your Shrimp Tempura and how to prepare shrimp (straight). I have been making the batter with seltzer water. Do you recommend I change? I also include shrimp and chicken in my tempura. Hi Peter! Some Japanese use this western technique to make tempura batter too these days, but traditionally we did not and still do not use carbonated water to make tempura. 🙂 You can definitely use it! 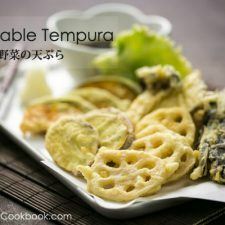 Hi, can I know if there’s a way to make tempura without using egg? I mean a totally vegetarian tempura recipe? My name is Paula from Australia, I clicked on your website for your vegetable tempura and couldn’t stop watching you making your recipes they all look so delicious. So I wanted to sign up but it’s coming up mailing list not active ???? I will try again another time. Thank you for all your beautiful recipes I am going to start with your veg tempura tonight ???????????? I tried your tempura recipe last night and followed it to a tee but the batter was quite thick right off the start and the veggies came out soggy and doughy. Any ideas where I went wrong? Thanks! 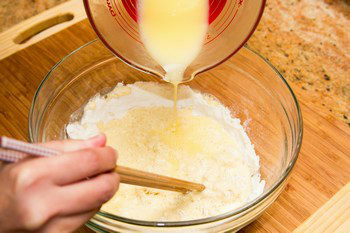 Thick batter – if it’s thicker than mine, then my first thought was that your 1 cup has probably more than 120 g. If you scoop up with a measuring cup, it can be as much as 150 g. So if you’re not using a scale, make sure to fluff up the flour first, and then scoop up flour with a spoon, and then transfer to a 1 cup measuring cup, That way, the weight is as close as 120 g.
Next is the deep fry oil temperature. When you said “soggy” my first thought was that your oil was too low. If it’s higher temperature, it shouldn’t be “soggy”. It looks like it absorbed so much oil at low temperature. Hope this helps a little bit…. Hi, I don’t have a thermometer to put in the oil, is there any other way I can tell if the root vegetables would cook thoroughly> last time the sweet potato took a very long time to bake so I ended up cooking it in a pot with boiling water. Hi Judy! 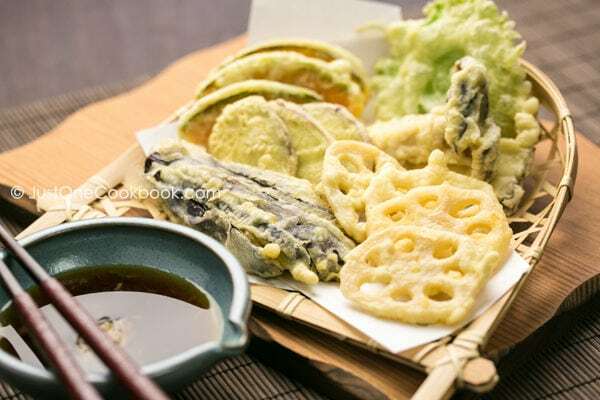 Tempura can be one of the difficult dish among deep frying dish, mainly because each ingredient has different deep fry temperature and cooking time. But the common sense apply so once you feel comfortable deep frying, it should not be too difficult. Root vegetables take time to cook, so it’s best at the lower temperature (but it’s not low temp) and slowly cook through. If it’s too low, then the batter will absorb all the oil. When you put the root vegetables in the oil, bubbles should come out. If it looks calm, then it’s too low. And make sure not to overcrowd because that means that you put too many ingredients and oil temperature went down fast. Just start with 2-3 pieces. I made this and it brought back memories–so much lighter than the tempura you often find in restaurants in the US! My husband felt like he’d never had real tempura before because the stuff he’d always eaten was so bready. One concern though. I had fresh lotus root and used it as indicated (peeled, washed, then soaked in water/vinegar). My husband came through the kitchen and ate one slice raw while I was cooking. He later read you shouldn’t eat fresh lotus root raw because as an aquatic plant, it may contain parasites. So now we’re wondering how rare “may contain” is—is it just a small chance or did he likely acquire Fasciolopsis buski parasite doing this. We bought the lotus root at an HMart in the US. I’m hoping it’s a rare thing and people don’t worry about it, but I can’t tell from reading online.